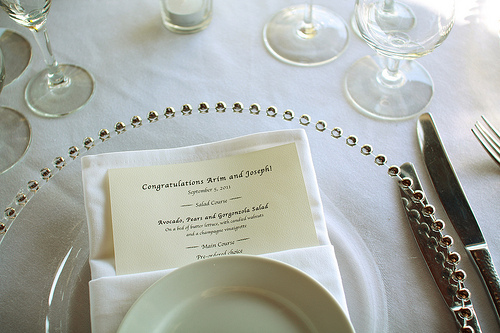 How to make wedding menus without getting too stressed! During my time working in hotels I put together a lot of wedding menus, so my first tip has to be - check with your venue, will they do them for you? You may find that they will for a corporate dinner but don't for a wedding, mainly due to color being so important at weddings. You will find that they have a standard menu cover that will probably have the venue name on, have a look at them and see if you would be happy to have them on your tables. If the color is not right for you then ask if they will print the inserts, this will leave you with just the cover to do. When you are making your own wedding menus think about your tables, how many menus will you need? I would have 4 per table of 10, not everyone is going to look at them and then you will not detract from the centerpiece or other decorations. A folded A4 card works well, you can use artwork from your invitations, or plain color card with menu, the date and your names printed, or you could have a picture that adds to your theme. To add an extra color you can tie the menu with a color ribbon. Recently I have noticed more and more people are having black and white photographs of themselves printed on the covers, which is a fun addition to the table decor. If your wedding menu is for the buffet table, it would be worth having A4 or even A3 sized card with the details of the dishes. Have copies at the beginning and also spaced through the buffet tables. You may want to have a starters menu and then a mains menu at the appropriate points otherwise you could end up delaying your guests as they read what is on offer. My advice would be to keep it simple and keep it fit for purpose, how to make wedding menus is by telling your guests what they are going to eat! Rather than a folded card menu you could have just a single sheet with the menu on. This could then be tucked inside the napkin at the table setting or you could have it placed on a charger plate. You will need to have one for each guest otherwise your tables could look a bit odd.